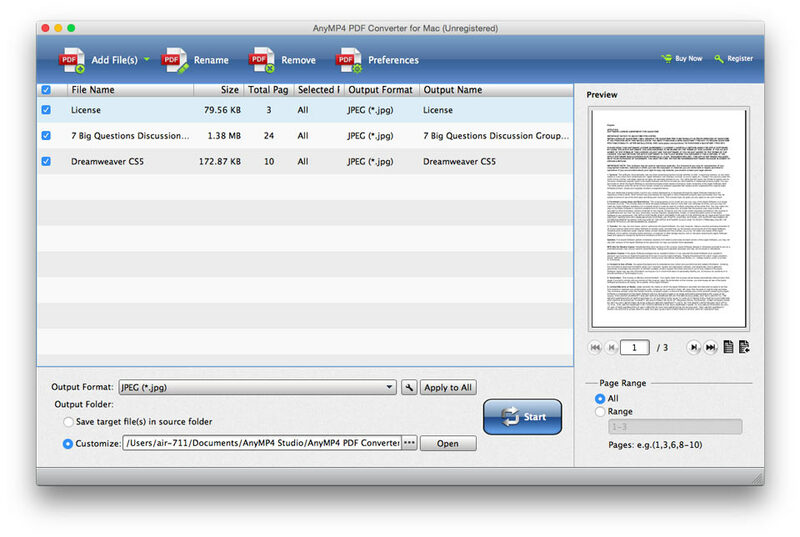 AnyMP4 PDF Converter Ultimate would be your first choice in converting PDF files to different documents and image formats. With the powerful converting function, which helps you convert any PDF file on your local disk in Text, Word, Excel, EPUB, HTML, PowerPoint and image formats like JPEG, PNG, GIF, TIFF, BMP, TGA, PPM and more amazing speed. The output files will keep the original design of pdf and effect by adopting OCR technology. To convert a PDF file to multiple formats, this PDF conversion software can also meet your requirement, because it has the function of batch conversion. Upper PDF Conversion software is professional converting function to help you convert any PDF file to multiple Office documents such as text, Microsoft Word 97-2003 (*. Doc ), Microsoft Word 2007 (*. Docx), rich text format (*. rtf), Microsoft Excel 97-2003 (*. xls), Microsoft Excel 2007 (*. xlsx), Microsoft PowerPoint 2007 (*. pptx) EPUB, HTML and PDF totally original quality. You can view the PDF file loaded into the preview window and open it with the PDF reader directly, it is so convenient. with the versatile PDF to image function, you can convert PDF files to several image formats such as TIFF, JPEG, PNG, GIF, BMP , TGA, PPM, and JPEG2000 simultaneously. You can choose the page range or all pages to convert specific page. And you’re easy to rename the PDF file and remove unwanted on the main interface PDF file. Converting your PDF file to image format and watch it on your portable device for convenience whenever and wherever you go. This powerful software PDF Converter adopt the OCR technology, which has the function to improve the accuracy and speed of recognition, improved stability, and maintaining the original design, clear . Thanks for the OCR technology, and you can get much better effect in converting files ?? based on document images. In OCR settings, you are able to select the mode recognition as accuracy, balance, and speed according to yourself, and choose more kinds of languages for your output file to improve accuracy. This software allows you to select the output range of pages, all pages and page (s) defined self. You can select the current page, and enter page numbers or page ranges separated by commas Range option ?? ?? . In addition, you can easily specify the output format settings. If the output file is the format of the image is allowed to define the image size, color and other special settings, if the output file is the file of documents, which are able to define the layout, text, image and other special settings to better enjoy. With it, you can easily convert a PDF file to different formats simultaneously and convert multiple PDF files to multiple documents and image formats without any limitation of time and quantity. With the support of OCR, you can convert multiple PDF files at an amazing speed. With such intuitive interface and ultra- clear design, everyone can master immediately.